You can really tell that the Infanttech Smarttemp was designed by parents due to all the thoughtful and useful features included. It can read your baby’s temperature continuously by sticking it under their arm during the night with an adhesive patch. The information is relayed directly to your phone or tablet by low emission Bluetooth. It’s FDA approved and can help prevent possible health complications that might result from high (or low) temperatures by alerting parents when little one’s temperature is abnormal. The Infanttech Smarttemp is a high-tech little thermometer that will give you wonderful peace of mind while also keeping your baby safe! The Infanttech Smarttemp keeps babies safe while making parents’ lives easier by continuously monitoring baby’s temperatures. Infanttech is an innovative company that designs high-tech baby gear. Their purpose is to keep babies safe while making parents’ lives easier. One of their advanced pieces of technology is the Infanttech Smarttemp. This is a 100% remote thermometer designed to provide continuous monitoring when your baby isn’t feeling their best. It’s made to be used during the night when it might be harder to keep a close eye on baby. Many parents can attest to how invaluable this technology is, especially if your kiddo is prone to febrile seizures (which can be very scary but are usually harmless) or health problems related to abnormal body temperatures. The Infanttech Smarttemp is an FDA approved smart Bluetooth baby thermometer. It allows parents to track their child’s body temperature in real time through their smartphone using safe, low energy Bluetooth that doesn’t produce high levels of EMF. The app on your phone or tablet will alert you when temperatures rise above or below the thresholds. It also can remind you when baby is ready for another dose of medicine. Infanttech is currently working on getting the Smarttemp to be a classified medical device that can be used in the hospital and clinic setting. Although fevers can be a cause for concern (what parent isn’t concerned about their sick baby?!) they can sometimes be beneficial and serve a purpose. However, sometimes fevers can turn bad very quickly, and that’s why the Infanttech Smarttemp thermometer can provide peace of mind and help monitor your baby throughout the night. Traditional thermometers require parents to frequently monitor their children’s temp manually which can disturb important sleep and make everyone exhausted. One huge benefit to the Infanttech Smarttemp is that it’s easy and comfortable to use. The thermometer is placed under your baby’s arm using a soft adhesive patch that is very similar to paper tape from a first aid kit. It’s thin, lightweight, and smooth so it won’t irritate baby during sleep. But, it’s also durable enough to allow being slept on and worn repeatedly. It’s thin, lightweight, and smooth so it won’t irritate baby during sleep. Versatility is a plus with the Infanttech Smarttemp. It can be used with both Fahrenheit and Celsius within the app (which is compatible with iOS and Android). The thermometer is also waterproof, making it a great tool to measure milk or bath water temperature. Because it is completely sealed (thus the waterproof capabilities) it can be reused for the extent of its life. It comes with 15 sticky adhesive pads that hold the thermometer in place. The sticky pads are disposable after each use, and buying replacements adhesive pads are extremely affordable. …it can be used on infants, children, and even adults. A couple other versatile features make the Infanttech Smarttemp a winning Bluetooth thermometer. Because it measures the surface temperature of whatever it’s touching, it can be used on infants, children, and even adults. Another versatile use for this thermometer is to use it on children, or adults, when exercising or playing in hot weather helping to prevent heat exhaustion. The app also provides great versatility, something that is sometimes lacking with other health monitoring devices for babies. Within the app, you can create multiple profiles for each kiddo. Each thermometer (if you buy multiple thermometers) has a unique serial number for identification. This allows the user to toggle between multiple thermometers in the app. The Infanttech Smarttemp thermometer has some very useful features that make it stand out. The 100% Bluetooth thermometer comes with a carrying case, 15 adhesive pads, and has up to a 3-year battery life with no charging required. It’s also waterproof so keeping it clean is super easy by just rinsing it after each use. Placing the thermometer back in the carrying case turns it off automatically to save battery life. It’s also waterproof so keeping it clean is super easy by just rinsing it after each use. To use the Infanttech Smarttemp, just pull out a sticky pad that comes in the box, place the thermometer on the sticky pad, then place the sticky pad/thermometer duo under your child’s arm. The sticky pad is very similar to soft paper tape found in first aid kits. When you run out of sticky pads, they can be bought separately at a very affordable price. To connect the Infanttech Smarttemp to your phone or tablet, simply download the smartphone app (both iOS and Android friendly) and make sure your Bluetooth is on. You can use the app to store up to 7 days of medical history to share with caregivers or doctors. After the Smarttemp syncs to one device, the information is automatically stored on the app and can be accessed with an internet connection. Because the thermometer uses Bluetooth low emission, there can sometimes be a limitation with distance and connectivity. This can be modified by using a second device that can be placed near your baby while wearing the monitor. Do this by downloading the Smarttemp app on one device and log in using the same credentials then place the device near the thermometer. Log out of the app on your phone, then log back in using the same credentials using the “remote login” button. Within a minute, the phone will sync up with the device near the baby (using an internet connection) so you can view baby’s temp in real time. This is usually only necessary if you are far away from baby’s room. You can use the app to store up to 7 days of medical history to share with…doctors. One other issue that parents have mentioned is that if baby sleeps with their arms above their head, lower readings can sometimes occur. However, the Infanttech Smarttemp picks up the temperature on whatever surface area it’s on, so as long as it’s placed correctly this shouldn’t be a problem. What’s awesome about the Infanttech Smarttemp is that it lasts up to three years without needing to replace or recharge the battery. That’s a great life for a thermometer! However, if it was used heavily (like daily for example) it should be expected that the battery will run out sooner. 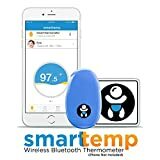 It does have the best longevity compared to other Bluetooth smart thermometer on the market and other smart health monitors that we’ve reviewed. …it lasts up to three years without needing to replace or recharge the battery. Because it’s sealed, waterproof, and durable, it also will stand the test of time without breaking down or wearing out. It’s built to last through many rough nights and give parents peace of mind and keep baby safe. The Infanttech Smarttemp comes with the thermometer, a carrying case, 15 adhesive pads, and up to 3 years of battery life with no charging required. Infanttech is a smaller parent-based company. Many times with smaller companies, great customer service is a top priority for them. There really isn’t a great troubleshooting page on the Infanttech website, but they give many contact emails so they can assist with any problems. Another great aspect to buying the Infanttech Smarttemp is that it is very affordable considering all that you get with this neat little package. Also, the replacement adhesive/sticky patches aren’t expensive at all with an MRSP of $4.99 per package of 10 patches. What’s better is that Infanttech has a cute little Smarttemp Gift Set that is perfect for baby showers or gifts! You can really tell that the Infanttech Smarttemp was designed by parents due to all the thoughtful and useful features included. It can read your baby’s temperature continuously by sticking it under their arm during the night with an adhesive patch. The information is relayed directly to your phone or tablet by low emission Bluetooth so that you don’t have to worry about exposing baby to EMF radiation. It’s also waterproof and easy to clean, making it versatile and durable. Because it’s waterproof, it can also be used to monitor bath water temps or milk temperature. And use doesn’t stop with babies! This little Smarttemp can be used on older children and adults to monitor temperatures on hot (or cold) days too! It’s also comfortable to wear due to its small, smooth, and flat design. Longevity is great compared to some other Baby Health Monitors we’ve reviewed. The Smarttemp sits comfortably underneath baby’s arm and prevents parents from waking baby throughout the night to manually check temps when your poor little bug is experiencing a fever. It’s FDA approved and can help prevent possible health complications that might result from high (or low) temperatures by alerting parents when little one’s temperature is abnormal. The Infanttech Smarttemp is a high-tech little thermometer that will give you wonderful peace of mind while also keeping your baby safe!